PanARMENIAN.Net - A U.S. submarine armed with tomahawk cruise missiles allegedly entered the Mediterranean Sea this week, a Gibraltar publication reported on Friday, August 31, according to Al-Masdar News. 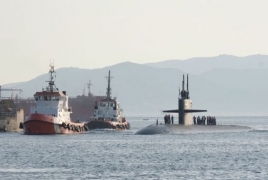 According to the Gibraltar Chronicle, the U.S. Navy’s Los Angeles-class submarine U.S.S. Newport News entered the port of Gibraltar at the entrance to the Mediterranean Sea. The source said the nuclear-powered fast attack submarine was spotted near the port on Thursday, with a Spanish customs boat being intercepted by a Gibraltar Defense Police vessel once it approached the US vessel. The last time a U.S. submarine entered the Mediterranean, it attacked the Syrian government’s positions in Damascus.